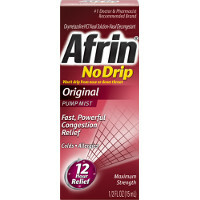 Afrin nasal spray instantly relieves sinus and nasal congestion caused by allergies. Instant 12 hour relief. Works very well for clearing nasal passages.